The Slotcar Outhouse • View topic - The 'Red Team' Unacceptable face of slotracing? 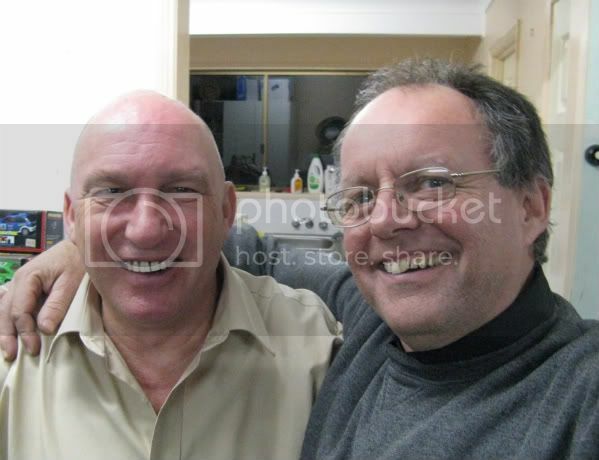 The 'Red Team' Unacceptable face of slotracing? Who are the Red Team? Where do they come from?? Where do they go. and most of all, what do they get up to, and is it legal?? This much I can tell you. The ‘Red Team’ are G**** ******l, B*** *****s, J*** *********n and P*** ****s! Well, the enigma which is the Red Team can only be loosely described as a cult slotracing group. Little is known about them or who they are. Their dealings with the outside world are strictly on their terms. Many a curious racer and collector has attempted to penetrate their almost Masonic cloak of anonymity but with no success. But, for the first time in a long time and probably for the last time, the Red Team have decided to give the outside world a glimpse of their ‘sanctum sanctorum’, their members and their rituals. This has been prompted mainly by the bad press they have received in the past with those on the ‘outside’ casting rumours and aspersions about this group, purely from a jealous standpoint I might add! 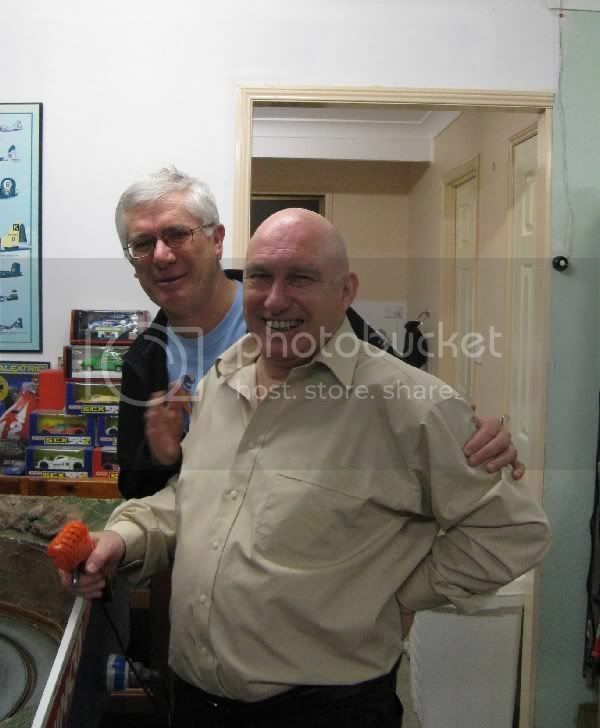 Rumours about perverting the course of all things slotcar and holding elitist court over lesser slotters. The use and abuse of models and worst of all, malicious rumours about race fixing! 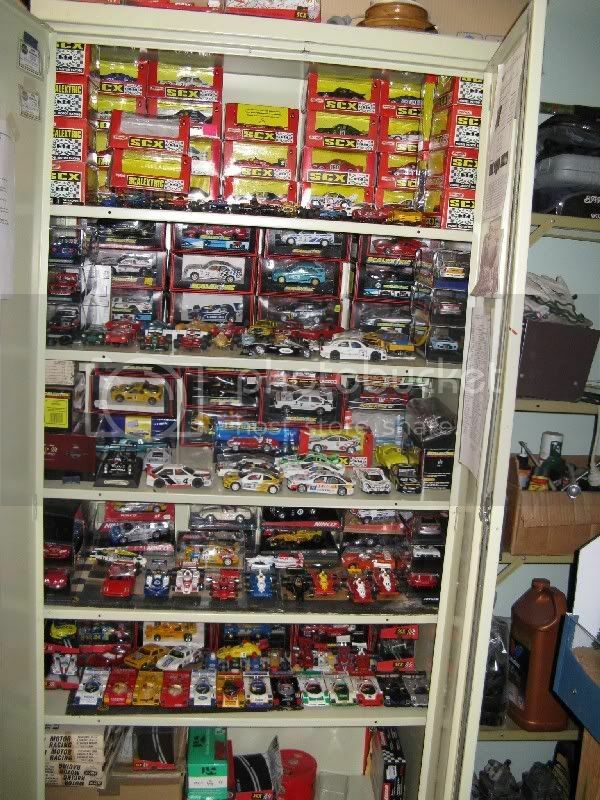 These rumours are spread by people who want to be part of the inner circle and allowed into the slotcar holy of holies. Ambitious people who will stop at nothing to gain entry to King Slotomans Temple,..... oops. sorry, I meant to say club... yes... err....club!! The beginnings of the ‘Red Team’ are clouded in the mists of time, some say they go back to the crusades and the Knights of St John , and others say they formed about 2004 at Alex Hills, whatever the truth, they are (as good as) an ancient order and practice their art as if it were a millennium in the making. The name hails from one of the many rituals observed by the group. This is the significant process whereby votive salutations are offered to ‘Bacchus’ for his bountiful harvest and the consequent ensuant of copious supply of red wine. This usually starts about 7.30 pm and continues into the night to the last man standing. As a sort of mediating process the group have resorted to racing model cars as a means of slowing down consumption and creating a gap in the quaffing rate, sometimes with great success. 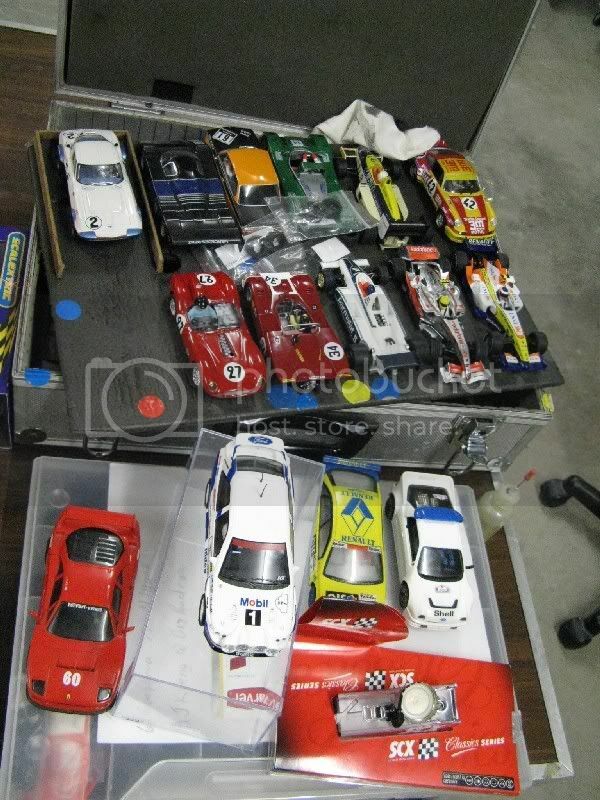 As happens on occasions, the process of racing slotcars (the group’s preferred choice of diversion), sometimes almost takes precedence over the event to such a point that the group have adopted all aspects of slotcar racing as their preferred diversion, almost to a point of obsession. On club nights a host of models new and old are taken to track, and competition of a loose order is indulged in. Dressed in suitable attire and donning their ritual pinafores, attendants pass around the room in order and visit the four points of the compass where they are asked questions to which they must answer correctly. Questions like ‘Are you on blue lane? Are you marshalling? Are you ready, what year is this, Who’s the president, and many more. Sometimes in the latter part of the evening they may well be escorted to their stations by other members concerned for their well being as they are almost in a state of blindness!! Hapless models going to an unknown fate. Depending on the occasion and whether there are guests or ‘entered apprentices’, they might well lower the lights and race rally or other models purely by the track lights which is very much like racing by candle light. The Race management system keeps watch over them and will snap them into line smartly by loosing a lap for them if they get too cocky or are just too fast!! It is in order for the most senior of the gathering to induce a penalty to miscreants by covertly causing their model to want for some sort of momentum. Many times I have been caught wondering why my model has become inactive so close to our most senior member, aka ‘The Legend’. With the lights on once again, new orders are received and the ritual of other models are in order with the founders indulging in masterful racing of products by Scalextric, SCX, Ninco and the like. Some models being prized possessions and being worth many hundreds of dollars. 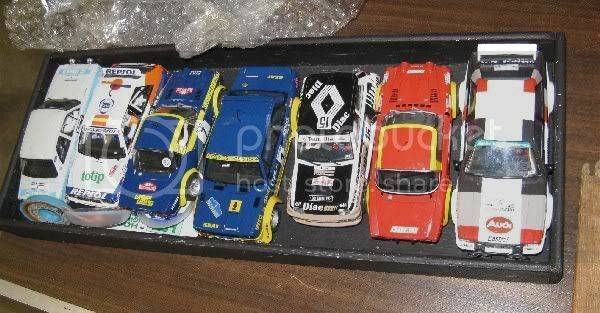 This is P***’s race box, a good cross section of models old and new! And home made. The club is a ‘dining’ club and at a juncture in the proceedings there comes the necessity to stop for sustenance of a more solid form to minimise the risk of over hydrating, and this takes the form of pies and rolls of indisputable haecceity. Needless to say, at this juncture and after a great deal of imbibement there is an element of confusion present amongst some of the participants (one in particular) and many questions can be asked such as, ‘am I up, what lane am I on, was that you!, someone put him outside!, etc... and with a feel of impending cessation the gathered group pack away their cars and with a final hail and farewell, journey off into the night (or sponge a lift from a neighbour), clutching their race boxes, on their different journeys to meet again by some predetermined arrangement. 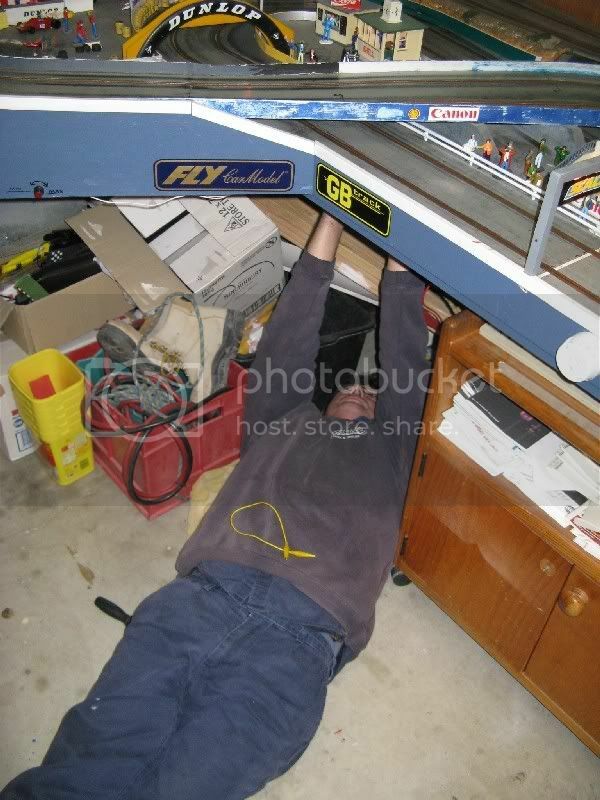 The reason G**** doesn’t race away, he can’t get his race box in the ute! I will add that during these halcyon moments there is a feeling of pure harmony and a sense of being ‘at one’ with an entity bigger than all of us. 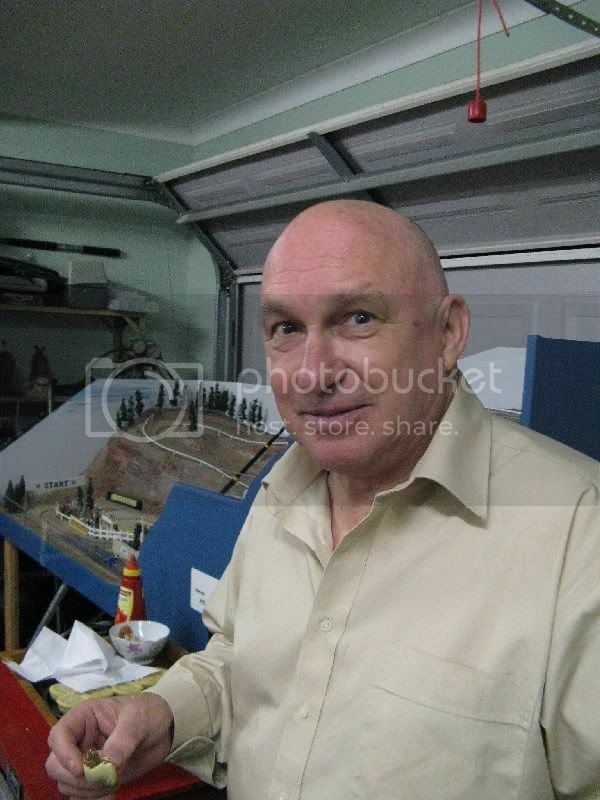 I am sure the members of the ‘Red Team’ would want it to be known that regardless of their own personal conduct, they have upheld the good name of slotcar racing in all its many guises, and that they are answerable to a far greater power,.............! With fines ranging from a few to many hundreds of dollars! Re: The 'Red Team' Unacceptable face of slotracing? Post more of this stuff! This was great. Next time I get our bunch together, I'll take a pile of pics, too. A couple of years ago, I found and bought a 1965 Imperial Red track by American Model Raceways (150 feet, 8 lanes, commercial), and I still have the pics of the trip to the 200 year old tobacco barn it was stored in for a decade or so. 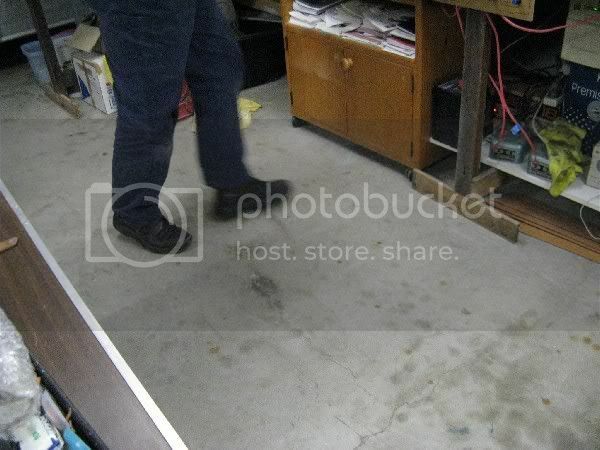 I have been restoring it alone, and I would love to show that off too. It took five large vehicles and our entire group to get it from the snaky old barn out in the countryside and bring it to my place. One day when the weather here is cold, I'll get everybody over here to braid it, and that will be a great set of pictures, too. Anybody over there restoring an old track? You gotta have fun between the serious bits and the Red Team do just that!! As my mum (bless her cotton socks) used to say "One day you're gonna be dead, so everything else is a plus!" If you do a feature I can let you post it.